In addition to cartooning, I paint watercolors and draw scientific illustrations. My series titled UnNatural History is a combination of all three. Someday they will be part of a book that's a whimsical look at my life as a naturalist. 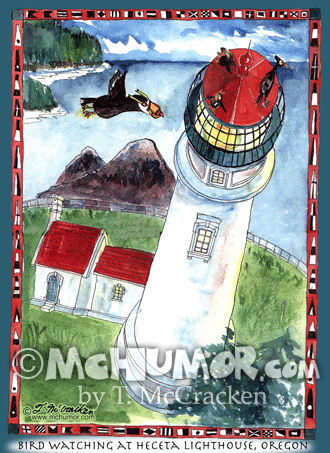 Lighthouse Cartoon 8007V: "Bird Watching at Heceta Lighthouse, Oregon" Birds sit on the top of a lighthouse gazing out at each other. 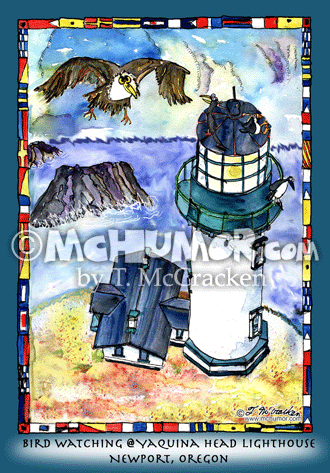 Lighthouse Cartoon 8020V: "Bird Watching @ Yaquina Head Lighthouse, Newport, Oregon." Birds sit on the top of the light house gazing out. 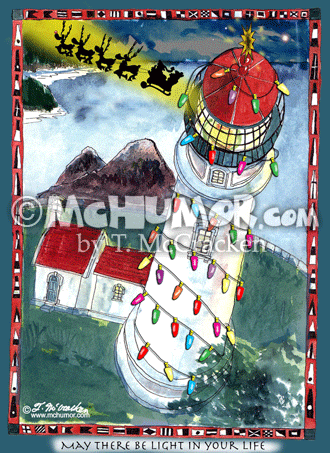 Lighthouse Cartoon 8315: A lighthouse has Christmas lights wrapped around it. "May there be light in your life." Starfish Cartoon 8663H: "Starry-Fish Night." 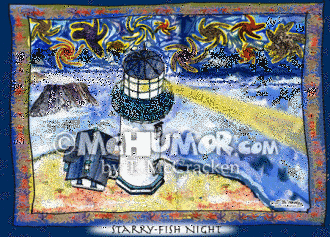 Sea stars re painted in the sky van Gogh like at a Yaquina Head Lighthouse..